Eric Favre Special Kid Immunity 125ml is a food supplement in form of a syrup that contributes to tone up the child organism and that has also an antioxidant activity. This food supplement contains pollen, known for its immunity properties. It acts also on the organism by fortifying the body and by favouring the good vitality. It allows to answer effectively to the small annoyances faced by children daily. Its delicious taste of banana will facilitate its taking. Before 5 years : Take 5ml (one teaspoon) per day, morning. After 5 years : Take 10ml (one tablespoon) per day, morning. Shake before use. Can be taken as it or diluted in water or another beverage. Do not exceed the daily dose recommended. Keep out of the reach of young children. To be used in parallel with a well balanced food diet and a healthy way of life. 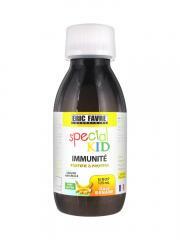 Indication: Strengthening of the immunitary defences. Eau, Fructose, Purée de Banane (Antioxydant : Acide Ascorbique) (10,9%), Miel (8%), Extrait Glycérine de Pollen (5%), Gelée Royale (1%), Extrait de Propolis (0,5%), Acidifiant : Acide Citrique, Épaississant : Gomme de Xanthane, Conservateurs : Sorbate de Potassium, Benzoate de Sodium, Édulcorant : Sucralose.